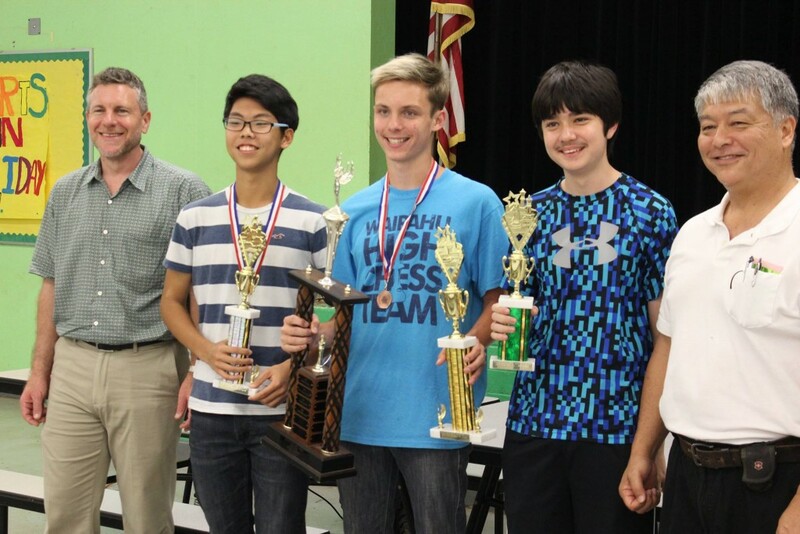 2017 Hawaii Scholastic Chess Champions Crowned! We had a record 158 participants in our 2017 State Scholastic Championships on Saturday, March 25th. It was an exciting finish to a great year. Based on these results, we will be nominating Dylan Tucker to represent Hawaii at the Denker Tournament of State High School Champions, Adriel White to represent Hawaii at the Barber Tournament of State Middle School Champions, and Kate Takenaka to represent Hawaii at the Girls Invitational Tournament of State Champions. All tournaments will be conducted with the US Open in August at Norfolk, VA.
See the attached zip file for complete results, cross tables and prize winners. (Download and open the zip file for the complete set of PDF files). See a photo gallery from the event on facebook here. Also, a week earlier, the HCF conducted the annual girls championship. This event also had a record turnout of 17 girls. Kate Takenaka of Moanalua Middle School emerged with a perfect score to become this year’s champion. See the attached PDF for complete 2017 Hawaii State Girls Championship PDF Results.